It may seem like Star Trek technology, but automotive HUDs have been with us for a while. In fact, HUD displays made their first appearance in fighter jets. Of course, since that time, the technology has advanced and become more readily available for consumer use. While some auto manufacturers are starting to include a HUD in their newer vehicles, there are still plenty of solid aftermarket options. Still, figuring out which aftermarket car HUD is right for you can be difficult. 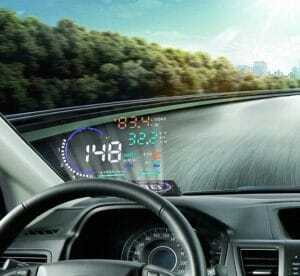 With different types of displays, different vehicle compatibilities, and different connectivity options, know what is a good value requires specific knowledge. That is why we have put together our list of the top5 aftermarket automotive HUDs as well as a comprehensive buyer’s guide, to you can feel confident making an informed purchase. 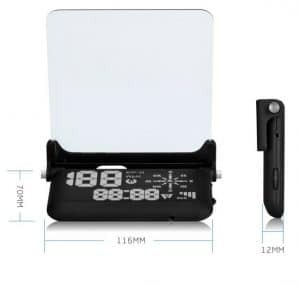 For anyone who’s new to heads-up displays or HUDs just know that the general purpose of having this device is to allow you to keep your head up and eyeline on the road, as you view statistics such as your speed, time as well as GPS and just about anything that appears on your phone. The Kivic is one such gadgets. 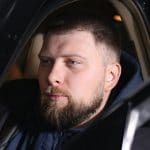 According to the instruction manual, the Kivic HUD beams the various contents on the road in front of the driver by connecting with Android-based smartphones and iPhones wirelessly. The driver can check information such as the time, vehicle speed, messages, incoming calls and GPS information while driving. 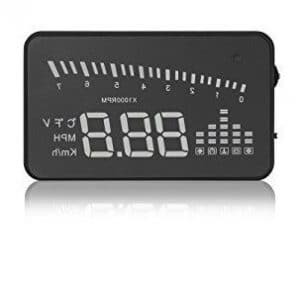 A key feature of Kivic is that all display information comes from your phone without relying on an OBD2 connection. You could use this device with any vehicle regardless of whether it is an OBD2 compatible, including cars made prior to 1996 (the year that cars had to be obd2 compliant). 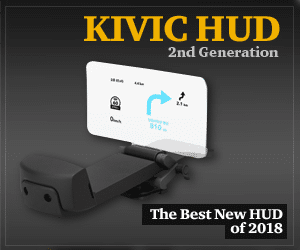 The new Kivic HUD comes with a handful of parts: mounting bracket which was already in place, the wire clip, power cable, cigar charger and a user manual. 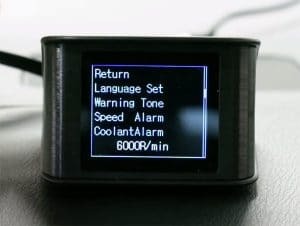 The main device consists of the display engine, the combiner, locking lever, power USB, and a light sensor. With the locking lever, we can make slight adjustments, so it’s easy to adjust a better view of a display. What it’s like to use a Kivic? Installation was incredibly easy. Just push the sticker. Center the Kivic on a dashboard in the middle of a cluster panel and plug it into the cigar lighter. One thing I would have liked to have seen is an extra USB out on the Kivic charger so that it would be possible to keep a phone charged while using. There are plenty of cars on the road that still only have one cigar lighter socket next to the driver. Something like this would have been nice and I think Kivic looks nice in a car. It’s sleek and feels appropriately placed, so the last step is to download the app. All options were pretty self-explanatory and once I hit a button it immediately began to display information. Bluetooth was already turned on and this part of the process felt quite easy. You’ll also receive notifications when someone calls or texts or when someone contacts you via Facebook. When receiving calls you still need to rely on things like a Bluetooth earpiece or placing your call on a speaker and when receiving a text you should use voice commands to both listen and respond. Full-screen mode and screencasting will allow Kivic to show whatever image your phone is currently displaying. Screencasting ability for reading text or even playing videos would not be safe, and even if it somehow is, it would not be an enjoyable experience. You have to train your eyes on words or video, so you lose the main benefit of having the Kivic which is about of improved safety. Just one exception to this would be the GPS. Running the GPS on Kivic is one of its strongest benefits. 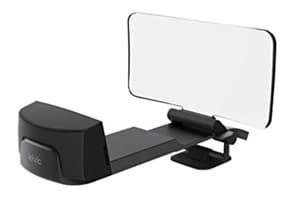 I use GPS daily even on familiar commutes to check the traffic conditions and having my eye line on the Kivic display feels much safer even compared to having a phone holder on a dashboard. It’s easy to see the road through the glass display. It removes tension that comes with each glance away from the road. The display is suitably bright during the day and there’s no trouble viewing time in miles per hour and at nighttime. Definitely, a great gadget for its price. T600 is a new design of TIMPROVE Universal Car HUD where it does not require the installation of a reflective film on your windshield. So, here you can read all the information directly on the Head Up Display unit. 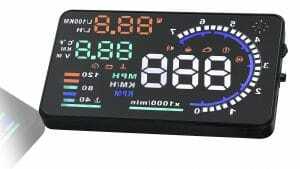 On the front of Head Up Display we have this LCD display. And then on the back, we have this rocker switch, which you can use to set up the unit and also toggle to different display. In the middle we have a photo cell to detect daytime and nighttime. So, during nighttime it will dim the display so it won’t be so bright. Next to it, is the mini USB connector that you connect your data cable to. And, that’s what is used to power this unit on and provide the driving information on this display. To install this unit, take the USB data cable and plug the mini USB connector into the unit. Now, connect the other end of your data cable to the DLC connector, or data link connector, on your vehicle. After that, place the sticky pad onto your dash. Place the unit right on top. That will keep it from moving around. At the top of the main display is the speed reading. The bottom left hand corner is the water temperature. Over here on the right, this is the car battery voltage. The switch is at the back of the unit. You can push this in, or move the switch left and right. To get into the main menu, push the switch in and hold it for a second. First item is language set. Next one is warning tone by default. If you move that switch at the back left or right, you can change a setting. The other item is speed alarm. The default may be increased or decreased. Next item is battery alarm. Default’s 10.5 volt. The other one is speed adjust. Default is 107%. With this setting, if you find that the speed reading on this unit is different than what’s on your dash, you can use this to fine tune the reading on the HUD so you can match the speed reading of the HUD to the speed reading on your vehicle. Let’s go to the next item: In OBD diagnose, you can scan for DTC, or trouble code, and clear the DTC. In a driving test, we have two choices – speed up test and break test. A speed up test shows you the speed that you’re traveling at and the elapsed time that it took. Data stream will display a list of pits on your vehicle. And, over here on the right is the live data that’s showing from your vehicle. You can change the view of a multi-function display screen by pressing in the back button momentarily. This will display the elapsed time and elapsed distance. If you press the button again, this will show you the speed, tachometer, trip time, distance, coolant temperature, battery voltage. Speed offset: If you turn off the ignition and the speed reading on the HUD is not zero, you can adjust the value here to bring that speed reading back to zero. You can reduce BAT adjust, or increase it up to 100%. Engine size: There you can enter the size of the engine. The fuel adjust allows you to fine tune the fuel consumption reading on your unit. Color change: You can toggle left and right to change your color of the display. CWT unit: This is the unit of measure for the water temperature. You can change this from fahrenheit to celsius, and the other way round. Speed unit: You can set it for miles per hour or kilometers per hour. Sum distance allows you to set the value here to match that of the mileage of your vehicle. Power off time: You can adjust it to any default. Sleep voltage: If the device is not turning off when you turn off the ignition, you can adjust the value so the unit will turn off. Factory set: Here you can reset the unit to factory default. TIMPROVE is very compact. You can place it in a different location if you want, such as directly on top of your driver’s side. Also, once you’ve set up everything on the unit, it’ll remember its setting. And, this unit will start up automatically when you start the ignition, and shut off automatically when you turn off the ignition. The Navdy is the unquestioned champion of the aftermarket HUD arena. Is accomplishes this feat on all levels and by providing a product which can accomplish tasks that are simply non-existent outside of it. Of course, all of these advantages come at a premium price which is by and far the most expensive product on our list many times over. Still, if you are looking for the best aftermarket HUD available, this is the only game in town. First, the Navdy features a dedicated screen that uses LED lights in full color. Quite simply, there is not another product on our list that can hope to compete with the brightness, clarity, and cohesion of image quality. The only issue is that the screen’s supposed transparent projection which is supposed make the image seem superimposed into the distance does not work for everybody. However, this is less of an issue with the product and more a result of different people’s biology not responding to the technology the same. 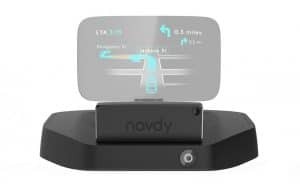 Beyond the display, which is good enough on its own to make this the top HUD on our list, the information, connectivity, and interactivity of the Navdy presents a product that will be difficult to beat even years into the future. The Navdy syncs with your smartphone via Bluetooth. Moreover, while it does require the use of a proprietary app, that app can sit in the background and still function. This allows the Navdy to use numerous 3rd-party apps or other apps on the phone without issue and will not interrupt the products function like it would with the Garmin. As icing on the cake, the Navdy can even respond to voice commands–though the effectiveness is a bit spotty – or hand gestures. With these interactive functions, you can answer calls, respond to texts, and get directions in real time. 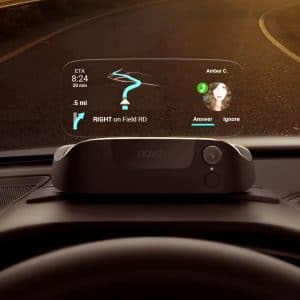 The display does not project directly onto your windshield, forcing you to continuously refocus as you look from the road to the HUD and back. This aftermarket HUD is a barebones product. Keep in mind, there are many people who have no interest in all of the other pieces of information that the other HUDs on this list provide. In fact, there are numerous customers who have purchase some of the other products that noted they specifically used tape to block out some of the unwanted clutter to better focus on only the information they were interested in. Of course, this can be a bit of a double – edged sword. 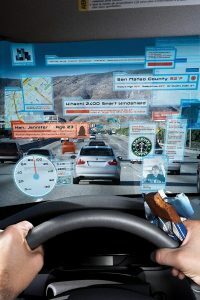 While the total amount of information the HUD can display is not truly compromised, and numerous users will appreciate the displaying of a single piece of information at once, switching through the different pieces of information can be tedious and ultimately takes your eyes off of the road. Moreover, this HUD features the worst display out of any on our list, and there are no ways to correct it like with some of the other products we reviewed. 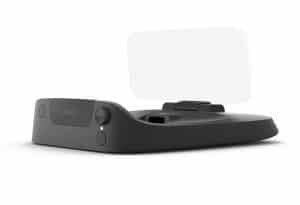 The Arpenkin, as a budget HUD, uses a projection display onto a film placed on your windshield. Unfortunately, this film does little to alleviate the problems common with many projection HUDS. If you are using the Arpenkin during the daytime – regardless the angle of the sun or whether it is overcast – expect your image to seem dim and the resolution to get fuzzy. If you are driving directly towards the sun, the image will disappear altogether. Moreover, most modern windshields use a type of polarized glass that makes the image split into two. Some of the other products on this list who suffer this issue have a workaround by placing a black film behind the screen. Sadly this does not work with the Arpenkin, which makes this only suitable for nighttime driving. 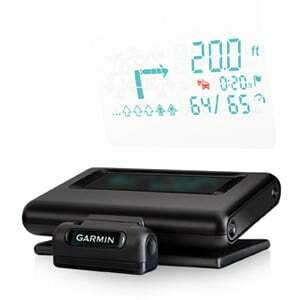 After the Navdy and the Garmin, this is probably the best HUD for most people – assuming it works for you vehicle. Unfortunately, the ZXLine was designed to work primarily in newer model vehicles. This means if your vehicle is 7 years old or older, there is a good chance the ZXLine simply will not function. To make matters worse, the English translation of the directions were written by a non-native speaker of English. As such, they are often confusing, it not outright contradictory. 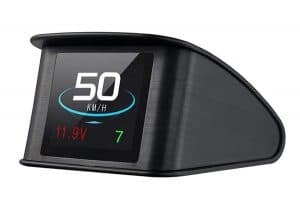 However, if you have a newer model vehicle and are not looking to spend over $100 on an aftermarket HUD, the ZXLine will perform better than either the Echoman or the Arpenkin. However, both of those other models have clear advantages in some respects, so you will need to weigh what it is you want most. For instance, the ZXLine features the largest display out of any product on our list – including the Navdy. However, this display is limited to a projection which is less than ideal. Still, the ZXLine’s film does at least perform fairly well – especially compared to the other options. Of course, it is still not as clear or bright as a dedicated screen and will suffer some depending on the conditions of the sky. One issue that is a bit of a push-pull consideration is the information organization. Quite simply, there is a fair amount of information, and it is all bunched together. This cluttered organization can make it somewhat difficult to see quickly. However, the ZXLine did at least color code the information to make it easier to see what you are looking for. Still, people with poorer eyesight might find it difficult to use. While the Garmin cannot come close to competing with the Navdy in terms of functional robustness, it does still provide far more versatility and options than any other product on this list and does so at a much lower price point than the Navdy. In fact, the Navdy is at least 3 times more expensive than the Garmin and may be more than that depending on the supplier. However, one area where the Garmin provides a unique feature that the Navdy cannot match is screen versatility. 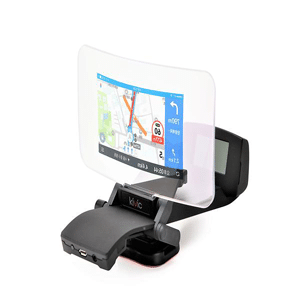 Whereas the Navdy uses a dedicated screen, the Garmin is able to use both a dedicated screen or a film projection. While a dedicated screen is without question better for image quality, smaller cars or those with a lower angle windshield slope may have trouble accommodating the HUD and screen without seeming awkward, unsightly, or just not fit properly. Moreover, while the Garmin does not feature the same breadth of 3rd-party app compatibility as the Navdy, it does use a proprietary app that allows GPS and directions – though in a more limited context. The Garmin also accomplishes this connectivity via Bluetooth, just like the Navdy. Unfortunately, that is where a number of the favorable comparisons end. One big issue with the Garmin is the requirement that the app remain at the foreground of your phone while in use. ASide from the limitations this places on its use, it also means that the HUD will literally cut off if you receive a phone call or check a text message. Moreover, the onboard GPS and directions of the Garmin are far inferior, often not entirely accurate or precise. The Echoman holds a unique position on this list. While it does utilize a dedicated screen on which to project its display, the screen is definitely inferior to both the Navdy and the Garmin. Of course, using a screen, it is still superior to simple projection displays. Unfortunately, this does not prevent some of the same issues as projection displays which is a bit troubling. However, many users have found that by placing an opaque sheet behind the screen, these issues are completely resolved. Still, this requirement speaks to a larger issue the Echoman presents throughout its use: poor design. For one, the display does present a good amount of information. In fact, the Echoman is unique in that it is the only HUD on our list that presents your altitude. In fairness, the Navdy could be used to find that information as well, but it is not presented natively. As such, if you are driving over mountainous terrain – like in Japan where the Navdy was developed – you will be able to see your altitude. Unfortunately, both the altitude and the compass – the other piece of information not often found on a HUD – have their own issues. For some reason, these features regularly find themselves out of sync and must be realigned regularly. However, the HUD does not present the method for doing so in an easy manner and is not even necessarily effective once you do figure out how to change it. Another issue with the information is its real-time reaction. If you speed up or rev your engine, there is a 1-3 second delay before the HUD responds. This also applies to changes of altitude and direction. For long-driving, this is not an issue. However, city driving requires constant change to these qualities, leaving you essentially with a range and not an exact figure. There are only two types of aftermarket automotive HUDs at the moment: projections and screens. Ultimately, the HUDs that utilize their own screen are generally superior. However, the material of the screen will play an important role in whether this effect occurs as well. However, there is no standard material used for HUD displays that use a screen, though avoidance of plastic composites is advisable. Unfortunately, the HUDs that utilize a screen are also generally significantly more expensive than HUDs that simply project the image. Still, you get what you pay for, and projection HUDs have their own issues. The biggest problem with projection HUD has to do with the image quality. In the most ideal conditions, the image quality of a projection HUD will generally be pretty good. However, ideal conditions are usually limited to at night without too many bright lights. During the day, and especially if the sun is in front of you setting on the horizon, the image of projection HUDs can be completely washed out. Moreover, projection HUDs are also far more likely to suffer from double vision, regardless the light conditions, than HUDs with a dedicated screen. Whether or not this occurs and the extent to which it does has to do with the type of glass and construction of your windshield as well as the material used for the film on which the image is projected. This also requires you to stick a small piece of film onto your windshield which can be difficult. Specifically, you need to know exactly where the film should be placed which can take a few tries of trial and error. Moreover, depending on the HUD, the film itself may be sticky. This can make removing it from the windshield difficult, and if you have to reposition it numerous times, it may lose some of its adhesive integrity. Most HUDs still connect by way of wires. This is especially relevant for the HUD’s ability to display the vehicle’s performance. Moreover, many HUD’s are also powered by the 12 volt vehicle outlet located on your dash. However, if your HUD connects to your smartphone, it may require another stage of connectivity. In this regard, the HUD may connect directly to the smartphone with a cable, or it may allow connection through Bluetooth. Whether or not your HUD connects to your phone will also impact the amount and type of information you can receive. HUDs that do not connect to a smartphone generally only receive information from the vehicle itself. This information can include, speed, RPMs, engine temperature, and a host of other pieces of information. However, if your HUD connects to your phone it will often provide directions when driving, and some of the more advanced HUDs will even allow you to use 3rd-party apps. This consideration can broken down into 3 qualities: brightness, resolution, and cohesion. Cohesion in this instance relates to whether or not the display creates a double-image effect or not. Generally, it is the polarization of windshields that cause this effect. The brightness will have a lot to do with the type of illumination–with LED being the brightest. However, the brightness will also hinge on whether the display is projected onto a dedicated screen or a film placed on the windshield. The same considerations which impact the brightness of the display will also impact the resolution and the cohesion with the same factors producing a better or worse quality. This consideration can be broken into two parts: smartphone and vehicle. The best HUDs connect to your smartphone and even allow the use of 3rd-party apps while in function. However, even for the HUDs that connect to your smartphone, many of them require the use of HUD-specific apps and may stop working when you switch to a different app. The other compatibility consideration for HUDs has to do with the vehicle in question. Different vehicles have different readout systems which measure the vehicle’s performance. These readouts are OBD, OBD II, EOBD (for European standards), and JOBD (for Japanese standards). If your HUD and vehicle readout are not compatible, you will not be able to receive information about your vehicle’s performance through the HUD. If money is no issue, the Navdy is the only option that can provide a full modern experience. Aside from its impressive dedicated screen size, it also presents more information than any other product on our list. 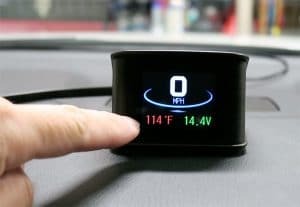 Of course, this has to do more with the Navdy’s ability to connect with your smartphone and utilize 3rd-party apps, but it is still an impressive feat to be able to control your smartphone with hand motions directed towards your HUD. Beyond the Navdy, the Garmin offers a decent product at a greatly reduced price, though the smartphone functionality is greatly reduced as well. For a stripped down, budget option, the Arpenkin is a solid choice, though the ZXLine may be a better one. here’s what i’d like: 5hz or better gps determined speed, projected onto the windshield, for race track driving. that’s it. Navdy appears to have gone dark around the time your article was published. Their social media all seems to have stopped activity, and more tellingly, their store page has been down for weeks. i.e. they don’t appear to be able to sell things right now. I’d love it if you are able to find out if they are still alive. They are basically dead. They sent a notice out to potential creditors. It’s basically what small businesses do to liquidate instead of an outright bankruptcy. There is a very small chance they are restructuring, but either way, if you bought one or buy one, you are on your own. NAVDY just sent out an email, their assets are being assigned in California and they are out of business. Shame. I liked their product. Update is probably required regarding Navdy – seems like they are in liquidation – as of now – the product is not available. Navdy no longer works with IOS 11.2 or iPhone 8 & X. I was an initial investor and have had it for as long as it’s been available… it’s too bad they’re leaving all customers in the dust, but it seems they’re done for. This was actually an issue with iOS 11.2 and Bluetooth. So Apple’s fault – not Navdys. Issue has been fixed in iOS 11.2.5. Navdy stopped paying Google Maps licensing fees. Only way to get it to work now is to look something up in Maps, add it to a new or existing contact and then look up the contact in the navdy app on the iPhone. If you look up a location on the map in the iPhone it won’t find it. Look up the contact and it will find the location and plot the route. With Navdy Now kaput, why can’t someone come up with a 3rd party app that will do what the Navdy App did? Hi Derek, have you looked at the VIZR HUD? Any comments ? I would like to get reviews from you for the VIZR HUD. Please send to me ASAP. Was thinking of buying this week for Christmas gifts. Today’s date is 12-4-18. Yes I too am interested in VIZR for Christmas presents. Any thoughts on the VIZR? I was looking at VIZR but the reviews I found said it was a waste of money. HERE’S WHAT I WANT.As I have looked at VIZR for sometime and NAVDY too….I saw the light about its demise sometime ago….I want an Ontario type for my car. I don’t want a full time connection to my phone although the option could be there ( draining my battery ,interrupting calls etc) But a dedicated GPS that will also work independent of my phone if I want that. I have traveled enough to know that using two of the major phone company Networks using my phone or my tablet( love that with a big screen), that depending on the area that you’re in driving through reception will drop off and just keep circling for a connection. Not reliable at all especially having to pull off on the side of the road and figure out what to do Having had experience with a dedicated older plug-in TomTom it was much better. I also got a GPS built in from the factory with my car good in an emergency but not always updated like an OnStar. And the voice response is ridiculous. So here I am with several options using them all at once if I’m in a dead zone. I still think satellite is best and you would think in this day and age that it would be doable and affordable. Is any company out there listening? The idea of leaving off everything included in the modern smartphone is very good. Of course, I was also very much looking for iScout for features that I don’t have on either my car or my phone, particularly blind spot detection. My dream setup would have indications for a Valentine 1 or similar high end radar/laser detector and also be plugged into Waze for similar reasons (spotting cop traps, etc) with OBD2 integration for display of metrics the makers don’t make gauges for (most have gotten good on tire pressure but a few still only give a dummy light). Something modular would be best to let the tuner and gadget crowd go for what they want. Was just about to buy Navdy when they started circling the drain so got scared, but it still appears the best executed. The base was a bit bulky. As a gadget geek I’m still hoping to get one and see if it can be cracked with firmware to use cell data to get traffic, etc from Google (car has all that built in but tied to XM with it’s subscription model). WHY IS Navdy on here it is DEAD – GONE. Enjoyed your article. I’m interested in HUD that syncs with both OBDII and smartphone. From phone: map/direction, text/ calls using hands free voice command. Is there currently a single product that can do this with either projection in screen or dedicated screen?